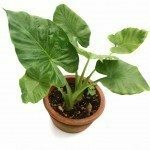 Elephant ear is a name given to several plants in the Colocasia family that are grown for their large, dramatic foliage. These plants are most often grown in cooler climates as an annual where they do not become a problem. However, they are hardy in zones 8-11 and grow as an evergreen in zone 11. 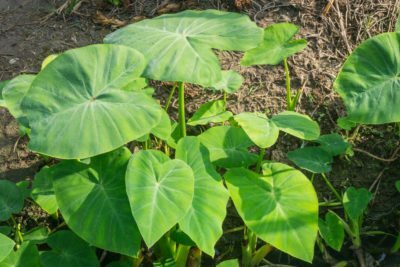 In hot, humid, tropical locations, one little elephant ear plant can all too quickly become a mass of them. How do you get rid of elephant ears? Continue reading for the answer. 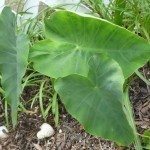 How Do You Get Rid of Elephant Ears? Giant elephant ear (Colocasia gigantea) and Taro (Colocasia esculenta) are plants in the Colocasia family that both get referred to as elephant ears. The common elephant ear can grow up to 9 feet tall though, while Taro, only grows to about 4 feet. Elephant ears are native to Central and South America where their large tubers are eaten like a potato. Taro is native to the tropics of Asia, where their tubers are also a food source. 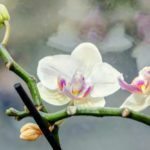 Both plants are native to sub-tropic and tropical locations, both spread by underground rhizomes and both can easily get out of hand pretty quickly. Elephant ears are listed as an invasive species in Florida, Louisiana and Texas, where they have caused many problems by invading natural waterways. Their dense tubers can clog shallow water ways and cut off water flow to native species of plants, fish and amphibians. 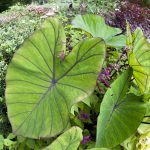 Elephant ear’s large foliage also shades out and kills native vegetation. Getting rid of elephant ears is no simple task. It requires persistence. Removing unwanted elephant ear plants involves using herbicides as well as actually digging up the aggressive tubers. When selecting an herbicide, read the product label thoroughly, especially if you intend to replant in the location you are spraying. Some herbicides can remain in the soil for a very long time, making it a waste of time and money to replant the area too soon. Always read labels carefully. The proper herbicide for elephant ear will be an all-purpose type, like Round-up or Killex. Spray all the aerial parts of the plant thoroughly with the herbicide, then give it time to start working. The foliage and stems will die back as the herbicide works its way down into the tuber. Once the foliage has died back, start digging up the tubers. Be sure to wear gloves; not only can herbicides cause nasty chemical burns, but people have reported skin irritations from handling elephant ear tubers. Dig down 2-3 feet to make sure you are getting all the tubers out. Any small bit of tuber left in the soil can quickly become another mass of elephant ears. Also, dig out wider than the elephant ears were in the landscape to get any rhizomes trying to head off on their own. Once you think you have gotten all the elephant ears, dispose of them immediately and replace the soil. Now you just have to wait, they may come back and you may have to redo the whole process, but keeping a careful eye on the area and applying herbicide and digging up any elephant ears that come back immediately will make the task easier. Repetition and persistent elephant ear control will eventually pay off.